I was at the Dupont Circle Fresh Farms Market (I love my local farmer's market) and was so pleasantly surprised to see that one of DC's best restaurants was doing a demo of one of their many locally-inspired dishes. 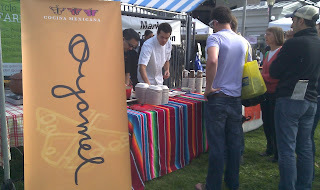 Oyamel is one of the many restaurants brought to the DC Metropolitan area by Chef extraordinaire, José Andrés. Oyamel's Head Chef, Omar Rodriguez, is a bit of a badass: he has a Bachelor's degree in Biology, and was accepted into medical school, but decided to follow his passion for food. 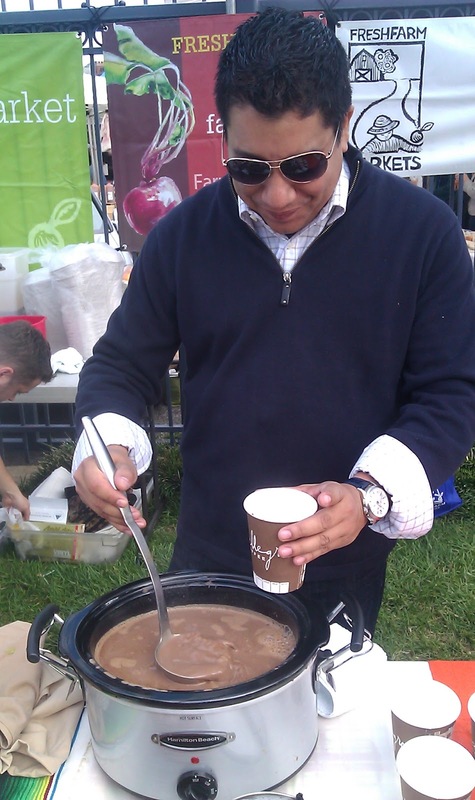 He is a 2006 CIA graduate and has been with José Andrés almost his whole career. The members of Oyamel that were present gave me permission to reprint the recipe they were sampling at the farmer's market. Large dice the sweet potato. Drain the canned hominy and wash with cold water to remove excess salt. Heat a pan on medium heat and melt the butter. Once the butter is melted, add and sauté the sweet potato. Make sure to get a nice caramel brown color on the sweet potato on all sides. 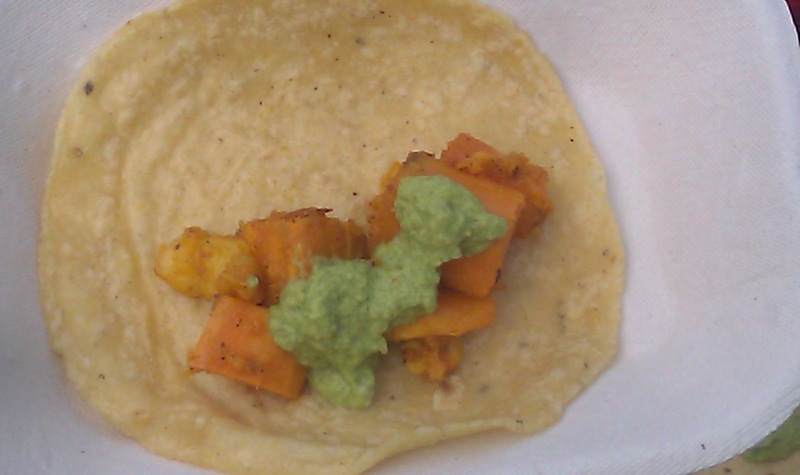 Once the sweet potato is almost cooked through, add the hominy and Achiote. Allow all the ingredients to cook together for one minute and then season with salt. Preheat oven to 350ºF. Toast the peanuts for 5 minutes. Then remove from oven to cool. Once the peanuts are cool, place in a blender with all the other ingredients and puree until smooth. If necessary, add some water to get the blender's blades moving. Warm a tortilla (corn in this instance) and layer a large spoonful of the sweet potato mixture and then a generous portion of the mole sauce. And cause I can't leave well enough alone, I think there's room in that taco for some leafy greans, no? ¡Salud y buen provecho! Oh, and did I mention that they also were giving out some Mexican Hot Chocolate (Oaxacan (ancho chile, I believe) hot chocolate with sugar, cinnamon, vanilla bean, cloves and steamed mil)? **happy sigh** perfect on a cool fall morning! 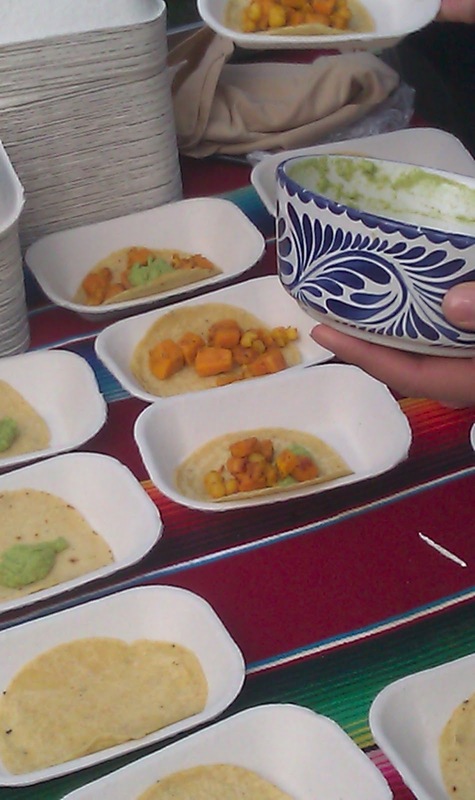 If you're in DC, make sure to check out Oyamel or any other of José Andrés' other restaurants. Not only is he a fantastic chef, but he's a big part of the community. He has strong ties with local producers and believes in giving back to them. Every year he and his team from Jaleo come to the Dupont Circle farmer's market and to make an 8' paella to share with the market community. Your farmer's market puts mine to shame! I'm jealous! ohh i so miss having a good farmer's market!!! PS - keep searching for answers. I finally found the right doctor and it's worth all the kissing frogs it took to get there so I can get better sans any crazy medications, etc. Amanda: I'm never going to stop pushing the doctors to treat me like a VIP. Cause each patient is one!